That MU win certainly helps a rather blah NCAA tournament resume for the #Badgers . But it's a rivalry, right? Vitto Brown hustling all over the place right now. Very active. Wisconsin 2nd half offense: ???????????? Wisconsin 7 of 12 in the second half, turning a 3-point halftime lead into a 55-39 advantage with 12:36 remaining. The #Badgers ' offense has cooled off with four starters on the bench. UW still ahead 55-41 with 11:08 left. #Badgers getting ragged with Hayes the lone starter on the court but still up by 14 with 11:08 left. UW ball OB. U12 (11:08): #PSUMBB trailing No. 15 Wisconsin 55-41. Costly turnovers by Lions have led to 13 UW points. Wisconsin with starters Koenig, Happ and Hayes on the floor, joining Trice and Iverson. UW trying to get a spark going after missing 6 of 7. Khalil Iverson hitting 3s too! In the span of four possessions, Iverson had a massive dunk and a 3-pointer. #Badgers up 62-44 with 8:47 left. Khalil Iverson with some serious spark off the bench for the #Badgers , who now lead by 18. I think even @JonAriasRadio will approve of this court rush. #PSUMBB takes a timeout with 8:47 to play, down 62-44. Payton Banks hits his third trey, now has nine points. Put Khalil Iverson on a poster while we're at it! U8 (7:59): #PSUMBB still trailing 62-44. Lions shooting 22% in the second half and have five turnovers (14 in game ➡️ 17 UW points). Wisconsin averaging 1.25 points per possessions this half and shooting 56.5% from the field. Badgers have built their lead to 69-45. #Badgers Brown, limited vs. Minny, has 14 points and 6 boards tonight. I've heard he's pretty good. U4 (3:53): #PSUMBB trailing Wisconsin, 73-50. Payton Banks and Tony Carr each have 12 points. Bronson Koenig now up to a game-high 20 points on 8-for-13 FG shooting. Brown and Happ each have 14 points. Trice, Pritzl, Moesch, Thomas and Van Vliet on the court now for the #Badgers . Penn State went from shooting 52.4 percent in the first half to 28 percent in the second half. UW leads 82-55 with one minute left. 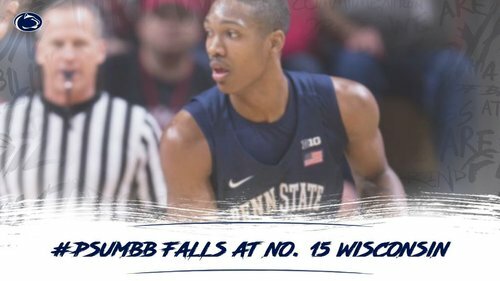 FINAL: No.15 Wisconsin 82, Penn State 55. The Badgers turn a 3-point lead at halftime into a blowout by shooting 55.6% in 2nd half. Final: #Badgers 82, Penn State 55. 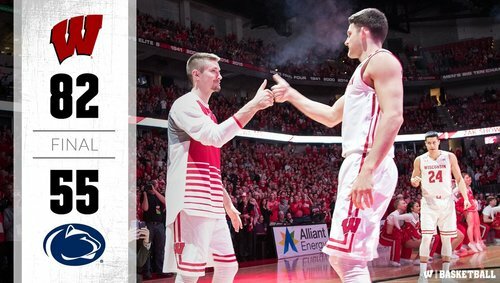 Koenig with 20 points, Brown 16 and Happ 14. Second-half PPP: #Badgers 1.44, Penn State 0.69.